Live Blog: Crisis In Japan; Saturday's Developments : The Two-Way Saturday's news on the aftermath of the March 11 earthquake and tsunami. Surrounded by debris in the devastated city of Rikuzen-Takada, Japan, a man rested on his walking stick earlier today (March 19, 2011). 10:40 a.m. ET: Eight days after a devastating, 9.0-magnitude earthquake struck Japan and sent a tsunami crashing into towns and cities along the country's northeastern coast, the death toll continues to rise, the work of helping survivors goes on and a desperate attempt to bring reactors at a nuclear power plant in Fukushima has the world watching anxiously. NPR.org's ongoing coverage is collected here. We've followed today's developments in this post. Check back early Sunday morning for another live-blog on events in Japan. A significant, positive development? CNN's Brian Todd just reported that Japanese officials say that as efforts continue to get water into the No. 3 reactor at the crippled Fukushima Dai-Ichi nuclear power plant, there are now "near zero levels of radiation" coming from that reactor. Update at 9:30 a.m. ET. Power To Cooling Systems On Sunday? "Japanese officials said Saturday they are attempting to reconnect the power supply and jump-start cooling systems at the stricken Fukushima Dai-Ichi nuclear power plant, as efforts to contain a nuclear accident in northeast Japan moved into their second week," The Wall Street Journal reports. "The Japan Nuclear and Industrial Safety Agency, a government body, said it expects the plant's No. 1 and No. 2 reactors to be supplied with electricity from the power grid Sunday morning. The agency said that reactors No. 3 and No. 4 are also due to have their power supply restored Sunday." "Slight amounts of radioactive iodine have been detected in tap water in Tokyo, its vicinity and most prefectures neighboring Fukushima apparently due to the nuclear crisis at the Fukushima Dai-Ichi nuclear power plant, the government said Saturday. "While the substance was found in Tochigi, Gunma, Niigata, Chiba and Saitama prefectures as well as Tokyo, traces of cesium have also been found in tap water in two of them — Tochigi and Gunma, the Ministry of Education, Culture, Sports, Science and Technology said, adding their levels do not affect human health even if they are taken in." "The Japanese Ministry of Health, Labour and Welfare has confirmed the presence of radioactive iodine contamination in food products measured in the Fukushima Prefecture, the area around the Fukushima Daiichi nuclear power plant. According to the latest data, the food products were measured from 16-18 March and indicated the presence of radioactive iodine. To date, no other radioactive isotopes have been shown to increase in the analysis of food products around Fukushima. "Though radioactive iodine has a short half-life of about 8 days and decays naturally within a matter of weeks, there is a short-term risk to human health if radioactive iodine in food is absorbed into the human body. If ingested, it can accumulate in and cause damage to the thyroid. Children and young people are particularly at risk of thyroid damage due to the ingestion of radioactive iodine." So far today, the U.S. Geological Survey reports, there have been three earthquakes of 5.0-magnitude or above in the same general region as the March 11 temblor. 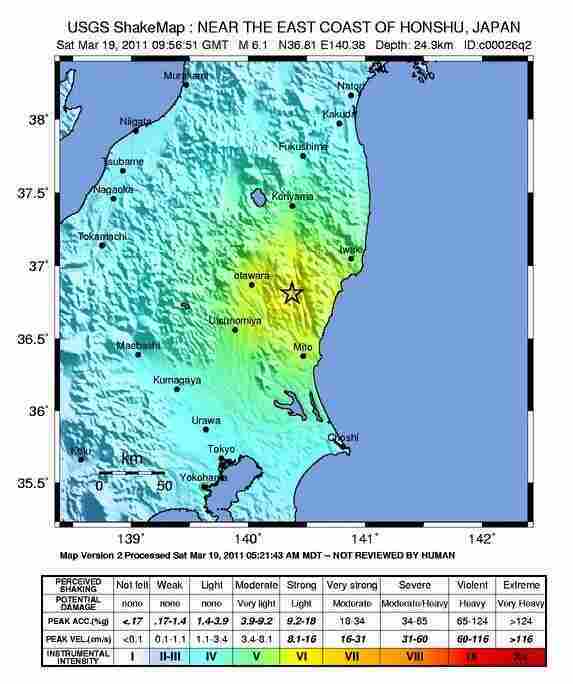 The latest was a 6.1-magnitude quake. Update at 7:50 a.m. ET. Progress At The Nuclear Plant? "One of six tsunami-crippled nuclear reactors appeared to stabilize on Saturday as Japan raced to restore power to the stricken power plant to cool it and prevent a greater catastrophe," Reuters reports. "Engineers reported some rare success after fire trucks sprayed water for about three hours on reactor No.3, widely considered the most dangerous at the ravaged Fukushima Dai-Ichi nuclear complex because of its use of highly toxic plutonium. 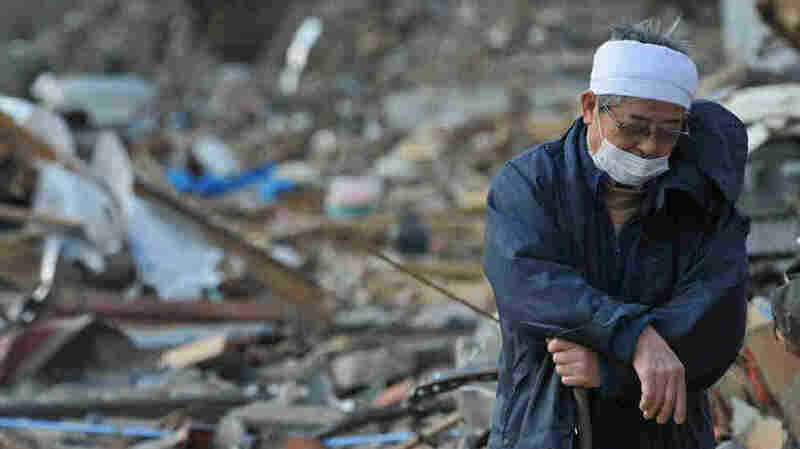 "A week after the disasters devastated the northeast coast, [Japan's] National Police Agency said Saturday that 7,348 people died and 10,947 were missing," The Associated Press just reported. -- Kyodo News reports that "Japan on Saturday continued efforts to contain the quake-triggered crisis at a nuclear power plant, with Tokyo Electric Power Co. trying to bring electricity back to its crippled nuclear reactors in the hope of restoring their cooling functions, while firefighters again threw water to cool down overheating spent fuel pools. Connecting a power line to the No. 2 reactor of the Fukushima Daiichi power plant is expected to be completed during the day." -- The Japan Times says that "battling to avert an atomic catastrophe, firefighting teams at the Fukushima No. 1 power station sprayed tons of seawater Saturday at its crippled No. 3 reactor in a seven-hour operation aimed at keeping its spent nuclear fuel rods from combusting." -- Over at the Shots blog, NPR's Richard Knox and Andrew Prince write that "the first radiation measurements from within a 37-mile radius of the disabled Fukushima Dai-ichi power plant do not reveal any immediate health threat — and perhaps not even any health problems measurable decades from now, if levels stay where they are." -- Still, The Associated Press reports that "Japan said radiation levels in spinach and milk from farms near its tsunami-crippled nuclear complex exceeded government safety limits, as emergency teams scrambled Saturday to restore power to the plant so it could cool dangerously overheated fuel. The food was taken from farms as far as 65 miles from the stricken plants, suggesting a wide area of nuclear contamination. "While the radiation levels exceeded the limits allowed by the government, Chief Cabinet Secretary Yukio Edano insisted the products 'pose no immediate health risk.' "
-- "The National Police Agency raised the death toll Saturday, reporting that 7,197 people had died," the AP says. "Another 10,905 were reported missing, the police agency said."